Dr. Ganesh at Santa Monica Esthetic Dentistry - Pregnant Women Be Aware! 1. It causes bacteria to grow much easier and when left controlled, causes multiple oral problems. 2. This makes gum tissue more sensitive to plaque and causes hyper exaggeration in the body's immune response to the toxins that result from plaque. 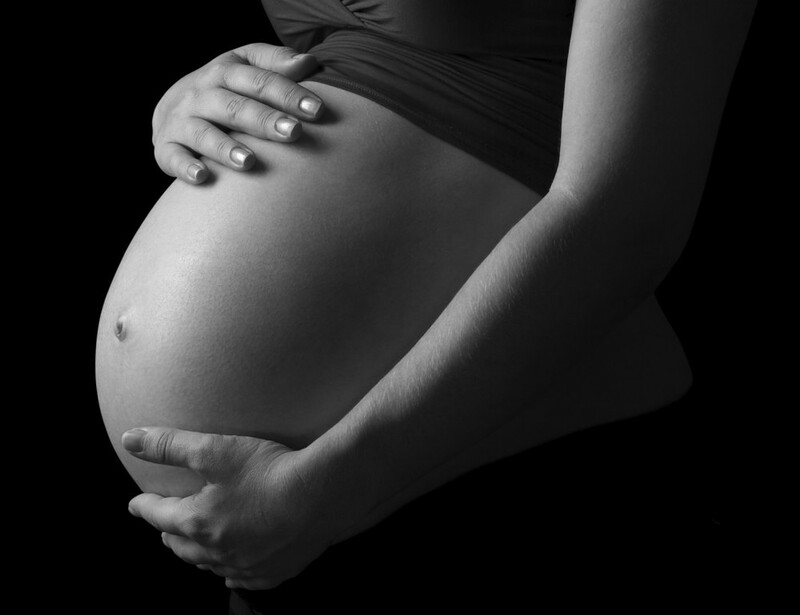 Approximately 40% of pregnant women will develop periodontal disease, which can cause premature birth. Shocking isn't it? Pregnancy causes hormonal changes that increases risk for oral health issues. Gingivitis (gum inflammation) and periodontitis (gum disease) will have a 40% increase in likeliness of developing sometime during pregnancy. That the smallest things have such a huge impact. It is vital to maintain good oral health during pregnancy for not only your well-being, but your baby’s as well. Brushing, flossing and using antimicrobial mouth rinse is even more important during pregnancy then ever before. The key to avoiding gingivitis all year around is the same. Pregnancy is not a good reason to skip trimonthly cleanings, it just an additional reason to seek professional help. Mothers with the most severe periodontal disease delivered the most prematurely at approximately 32 weeks. Whether treating gum disease reduces the risk of preterm birth is not yet known however there is strong evidence supporting the link. Pregnancy tumors are large lumps with deep red pinpoint markings that forms on inflamed gum tissue. These tumors can be commonly found any time during the course of pregnancy and are usually near the upper gum line. The tumors can bleed and cross over which will interfere with both speech and eating. If your are not maintaining oral health, one may expect to see these tumors in the second trimester of pregnancy. Pregnancy tumors are known by many other names: lobular capillary hemangioma, granuloma of pregnancy, pyogenic granuloma, and pregnancy epulides. Gum inflammation regularly appears between the 2nd and 8th month of pregnancy. Pregnancy tumors are, luckily, benign. These tumors are not cancerous nor will it spread. These tumors are an extreme inflammatory reaction to an irritation (food particles & plaque). 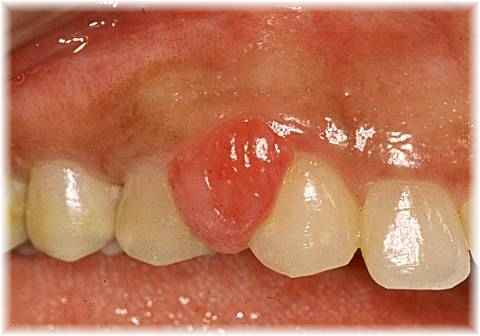 The tumors occur in up to 10% of pregnant women and of the 10% who do have pregnancy tumors, often also have pregnancy gingivitis. Luckily, pregnancy tumors disappear naturally on their own after birth. 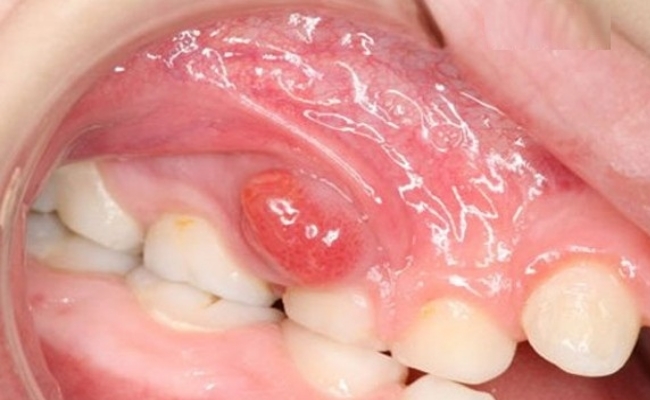 However, if the tumor irritable or interfering, a dentist or a specialist is able to remove it. Know, however, that if the tumor is removed during pregnancy there is still a great chance that it will relapse. This occurs in approximately half the cases. Regardless of the individual's choice, all women and men alike should seek professional help when a tumor arises in the mouth. If the lump is not due to pregnancy, there could be potentially a more serious issue that could prove deadly.